Well, I'm happy to report that I've gotten my first laptop. Yes...I've joined the rest of the world in being able to run around internet hap-hazardly and blog from the convenience of where ever I want to be! So happy about this! Although, just as I discovered that it is all too easy to shut the door to the basement and leave the toy mess behind when we moved in to this multi level home...Its also all to easy to have this computer attached to the end of my finger tips and sit on my already too large back side to catch up on the list of blogs I frequent. Oh well. Such is life! But in all honesty it will be a blessing to have after my knee surgery and not willing to travel to the basement to turn on the computer! Love this idea. 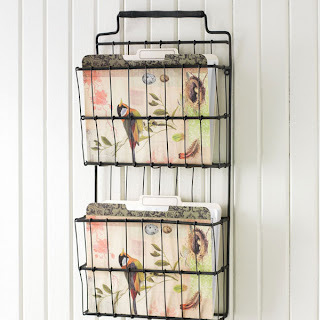 Its got that Industrial Farmhouse Chic that I like, and I could still keep my bill center in the kitchen, and looking cute in modgepodged file folders. Gotta find something similar to this, or bite the bullet and just order it for the $39 they are asking. Nope..I have to find a less expensive way. This is make-it-yourself-for-a-lot-less idea! 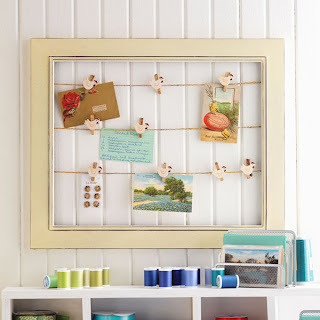 Find an old unused frame, or re-purpose a garage sale find...take the back off...add some picture hanging wire or twine for a more rustic look. I could do without the chicken details on the clips, but clothes pins would even be adorable. Paint them, or buy the little tiny ones you can get at the craft stores (by the crafts sticks). Easy cheesy! We could do this project for next to nothing! 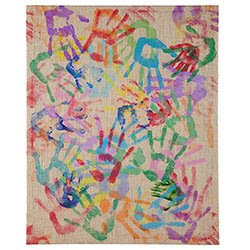 This will be something I want to use in my Craft Room. Use it as my idea board to post up ideas to use in my creative works! The last two findings are also from Wisteria. Another easy DIY project. Can't wait to add some personality to Becca's play space in the basement. Right now there is plenty of color with all the bajillions of toys she has. However..it just looks unfinished compared to the rest of the house. So...paint, burlap and more garage sale frames. 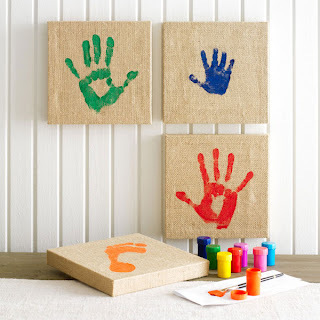 I've even been on the look out for clearance canvases for future projects I have on my list. What things are you finding that inspire you?